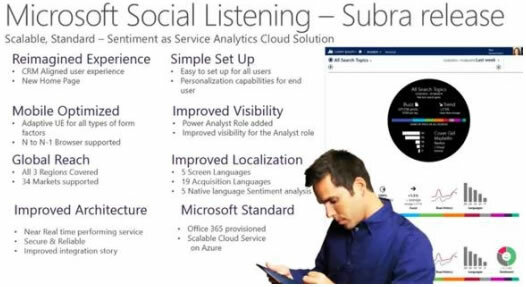 The Subra release has been renamed Microsoft Social Listening. This product is largely the reincarnation of the March 2013 NetBreeze acquisition and the subsequent rewrite which was needed to transition the product from open source software to Microsoft technologies. Later the product will blend integration and features from the more recent January 2014 Parature acquisition in a way that will link social listening with social engagement. Microsoft Social Listening will use the former NetBreeze functionality for keyword-based social listening, basic sentiment analysis and brand strength measurement while using Parature’s social customer service functionality to convert social incidents into Dynamics CRM for continued queuing, routing and resolution. That said, I found the sentiment and tone detection a bit lacking to say the least. NetBreeze always had a great UI and Microsoft Social Listening continues that user experience. The dashboards and metrics are pretty much limited to macro views of the brand, so this is a tool for agencies and senior marketing executives to measure their sphere of influence, share of voice, social media reach and other factors which give guidance (but not specifics) to marketing programs that are working or need improvement. The new architecture is also built for scale and extensibility. Microsoft is transitioning the sourcing of data from social network APIs toward real-time data acquisition, such as using the Twitter firehose. Social listening essentially performs a three step process of content extraction, sentiment analysis and storage of results in what the company calls Pipelines. That second step of sentiment analysis uses the company's proprietary Natural Language Processing (NLP) algorithm and is by far the most influential step in determining social listening's effectiveness. While the product is available in 19 languages, the NLP performs native sentiment analysis in the 5 languages of English, German, French, Spanish and Portuguese. This provides a unique strength among competing social listening tools because the multi-language processing permits native language social sphere filtering rather than requiring translation to English before applying keyword queries and sentiment analysis. This feature alone will sit well with global and multi-national brands. The NLP parses each social listening extract into individual sentences, translates words into tokens, identifies the words and tokens by type (i.e. adjective, noun, verb, etc.) and then classifies every word or phrase as Positive, Neutral or Negative. As you might expect this is a complex process which will require maturation. I asked Microsoft for their sentiment analysis and precision accuracy scores but the company declined to share that information. While the architecture and UX are solid, and the NLP is a work in progress, the product is weak in terms of scouring the social sphere. For example, it's Blog sourcing only monitors blogs on Wordpress and Tumblr. As a backup, Microsoft suggests customers will eventually be able to apply RSS feeds to monitor other blogs, however, this is manual RSS setup process and completely unworkable for the volume of relevant blogs. Social listening is a needed component in any social strategy, however, having deployed social listening solutions before I know that building hashtag and branded keyword queries may alert brands to potential problems and aid social service, but will not uncover new sales lead opportunities or drive incremental revenues for most adopters. Microsoft Social Listening looks to aid social service quite nicely, and with third party ISV solutions such as InsideView begins to accommodate basic social selling. Unfortunately, the company is without the most requested social strategy component of social marketing. I’m hopeful Microsoft’s social strategy will continue and ultimately include social marketing with the ability to support social campaigns across social networks, cascade messaging to contacts and into those contacts social spheres, append contact records with rich social attributes and support (website to social network) custom audience integration in order to improve campaign targeting, relevance and timing. The main cost driver for Microsoft Social Listening is the number of monthly posts acquired. A subscription to Social Listening will be included at no additional charge for customers using the CRM Online Professional edition subscription that costs $65 per user per month, when it’s released in Q2 2014. It will be available at an additional cost for on-premises customers. Social Listening can also be used as a standalone service. Microsoft Social Listening runs on Windows Azure and SQL Azure and is provisioned as an Office 365 service. Looking ahead, the below Microsoft Social Listening roadmap slide gives a glimpse of what's coming. The dashboards and metrics deliver sphere of influence, share of voice, social media reach and other factors which give guidance (but not specifics) to marketing programs that are working or need improvement.